lenNY's Yankees - A Bronx Bombers Blog: FRIDAY THE 13TH! All pitchers and catchers are expected to report to Tampa today, although some players like Derek Jeter have been there for multiple days now. Don't worry people, bad luck is just a coincidence. If Chien-Ming Wang tears his ACL today, then I might start believing in it. 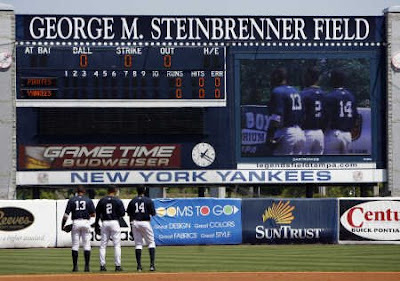 The Yanks' first spring training game is Feb. 25, against the Blue Jays. However, I'm sure there will be an intrasquad scrimmage or two before then. I always like Friday the 13th..My Original E Mail has the 3 !3 in it. If I was a Great Yankee Ballplayer #13 would have been retired. Also great day for the 1st spring training game.